This knife was made for Barrett-Smythe. I bought it from a collector who sold his collection. 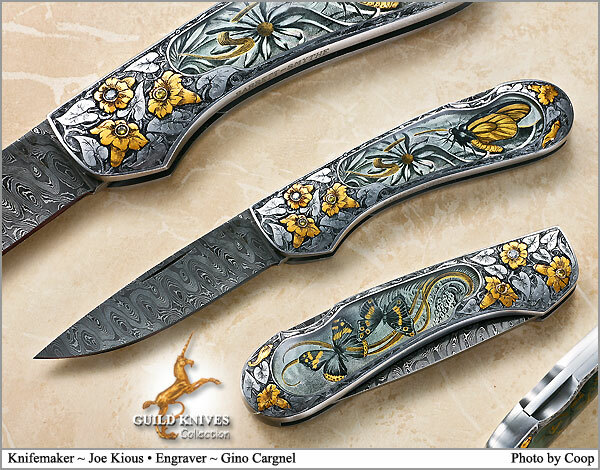 After Kious finished the knife, he removed the pure quartz crystal interframe scales and sent the knife to Italy for Master Engraver, Giovanni Steduto to engrave the gold inlayed butterfly scenes that now reside beneath the crystal scales. Steduto also proceeded to inlay and engrave Anthurium and Gold Hibiscus flowers. Finally he set three diamonds in each side of the knife. Heirloom quality.